"Leukippos" redirects here. For the asteroid, see 5950 Leukippos. Leucippus (/luːˈsɪpəs/; Greek: Λεύκιππος, Leúkippos; fl. 5th cent. BCE) is reported in some ancient sources to have been a philosopher who was the earliest Greek to develop the theory of atomism—the idea that everything is composed entirely of various imperishable, indivisible elements called atoms. 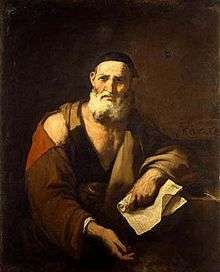 Leucippus often appears as the master to his pupil Democritus, a philosopher also touted as the originator of the atomic theory. However, a brief notice in Diogenes Laertius’s life of Epicurus says that on the testimony of Epicurus, Leucippus never existed. As the philosophical heir of Democritus, Epicurus's word has some weight, and indeed a controversy over this matter raged in German scholarship for many years at the close of the 19th century. Furthermore, in his Corpus Democriteum, Thrasyllus of Alexandria, an astrologer and writer living under the emperor Tiberius (14–37 CE), compiled a list of writings on atomism that he attributed to Democritus to the exclusion of Leucippus. The present consensus among the world's historians of philosophy is that this Leucippus is historical. The matter must remain moot unless more information is forthcoming from the record. The Leucippus of record was an Ionian Greek (Ionia, being the Asiatic Greece or "Asia Minor", forms western Turkey today). 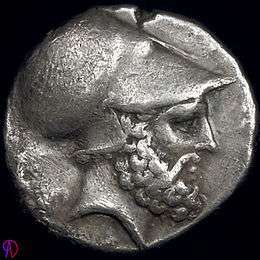 And he was a contemporary of Zeno of Elea and Empedocles (Magna Graecia, now part of southern Italy). He belonged to the same Ionian School of naturalistic philosophy as Thales, Anaximander, and Anaximenes, and he was interested in reality and not idealism as the Italic Eleatics were. ↑ The Cambridge Companion to Early Greek Philosophy, p. xxiii. Note that Democritus was a resident of Abdera. Some said Leucippus from Elea, perhaps since he was unsuitably associated with the Eleatic philosophers. ↑ Diogenes Laërtius says "Leucippus was born at Elea, but some say at Abdera and others at Miletus," Diogenes Laërtius 9.30. Simplicius refers to him as "Leucippus of Elea or Miletus," Simplicius, Physica 28.4. 1 2 "Leucippus", in The Presocratics, Philip Wheelwright ed., The Odyssey Press, 1966, p. 177. Laërtius, Diogenes (1925). "Others: Leucippus". Lives of the Eminent Philosophers. 2:9. Translated by Hicks, Robert Drew (Two volume ed.). Loeb Classical Library. § 30-33. Berryman, Sylvia. "Leucippus". Stanford Encyclopedia of Philosophy.